The Trump administration’s attacks on immigrants have far reaching implications. This past March, Commerce Secretary Wilbur Ross―with the support of U.S. Attorney General Jeff Sessions―announced that he was instructing the Census Bureau to add a question about citizenship to the 2020 census. The constitution mandates that our government undertake a count of every person in the United States every ten years. The census impacts more than just congressional district lines. It impacts the allocation of more than $700 billion in federal government resources to states and localities. It is a pillar of our democracy and if we get it wrong it distorts political power and the funding of our communities for the next decade. Right now, the Census Bureau is holding a public comment period―asking for our feedback on the Trump administration’s citizenship question. This is our chance to make our voices heard. Click here to submit an official public comment opposing the citizenship question in the 2020 census and help ensure the accuracy of this critical once-in-a-decade census. The administration’s attacks on immigrant populations―separating families at the border, increased ICE deportations, and targeting of immigrant Muslim populations―are already having a chilling effect on communities throughout the country. Adding this UNTESTED census question will have the likely effect of depressing response rates and distorting the accuracy of information.It will only add to the stresses and inequity recent immigrants are facing while taking resources away from already underserved communities. Stand with EPI and our partners in opposing the Trump administration’s citizenship question in the 2020 census. Click here to submit your official comment. At a time when Congress is cutting funding for critical programs―education, Medicaid, food stamps and more―it is crucial that we conduct an accurate census that properly allocates those limited resources. Income inequality is on the rise. Even as incomes of the bottom 99 percent improve with a strengthening economy, the gap between the top 1 percent and everyone else continues to grow. EPI is out with a new report, “The new gilded age,” which shows that income inequality is not just a problem in big cities and coastal states. The report breaks down what it takes to be in the top 1 percent in every state, county and metropolitan area—and shows that income inequality is a problem throughout the country. 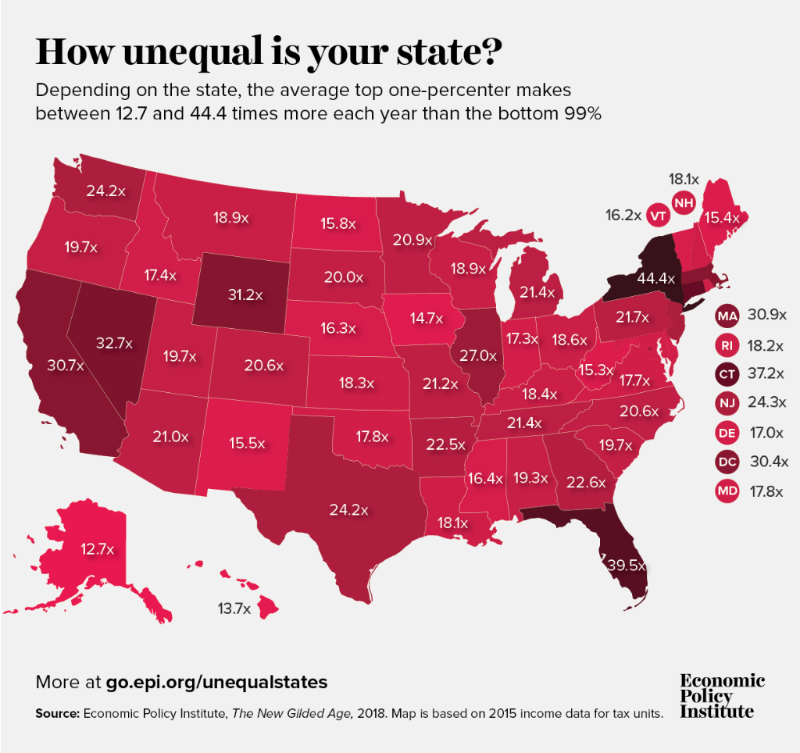 Click here to share this map on Facebook, which shows the level of inequality in each state. From 2009–2015, the incomes of the top 1 percent grew faster than the incomes of the bottom 99 percent in 43 states and the District of Columbia. And in nine states the top 1 percent captured at least half of all income growth. Nationally, in 2015, families in the top 1 percent made 26 times as much as the bottom 99 percent. Click here to view the state-by-state interactive feature and see how the average income of the bottom 99 percent in your state compares with the average top 1 percent income. These data are also broken down by county and metropolitan area. Since the 1970s, income inequality has risen in every state. But this trend can be reversed if we begin making different policy choices, such as raising the minimum wage, strengthening collective bargaining, and providing paid sick leave. Together we can rebuild the middle class and create an economy that works for everyone, not just the wealthy few.